While I'm scrapbooking and doing other things like work... (sheitel macher for those who don't know! )I continue to knit. This is where I am up to so far. I worked alot on this project because I had to see how it would evolve. Each line of Alef Bais took me 31/2 hours. Yep! Sat late into the nights to see it happen. Now I will put it to the side for a few days while I will be busy with family Simchas. I also want to make a sweater to bring to my great-niece whom I've never met. I hope to finish it before I get to the wedding. I will show it to you guys when I am done . I actually can't decide if I should use crocheted flowers or felt flowers. What do you think? When I was a little girl I had friends. They were the girls in my class. I never thought if I liked them or not. They just were my 'friends'. I invited them to my Bas Mitzva. I played over on shabbos. I went to the country in the summer with them. They came to my wedding. They were my friends. At the risk of sounding shallow I will tell you what I thought a friend was. (I hope to redeem myself at the end of this post). The first and most important ingredient for me was that my friend should think I was "all that." Which meant that I was pretty, she'd rather hang out with me than any other friends. The second important thing was that I could tell her my 'secrets'. The third and most important was that they always picked me up FIRST for a Shabbos walk and they ALWAYS saved me a seat. Now when I think back to those days I cannot believe anyone wanted to be with me at all. But maybe we were all the same at that age. Maybe that is what our needs were back then. I think back to our fights, as girls usually have them, and I cannot believe we were so ridiculous. I am saying 'we' but who knows maybe it was just me? Obviously as I got older I completely changed my understanding of what a friend is. I have been extremely fortunate to have several very close friends. Now I know that friendships come in many different sizes, shapes, colors and even ages. I have close friends that are 15-20 years younger than me and some 5-20 years older than me. I have close friends I speak to a few times a year. I have close friends I speak to a few times a week. What makes a friend for me today is many things. For me the most important attribute in any friendship is honesty. Mixed with love. I adore my friends that can point out my shortcomings and make me feel good about them. I adore my friends that listen to me complain , say all kinds of outrageous things and then backtrack on most of them, without judging me or making me feel foolish. I adore my friends that say "I want to tell you something but don't tell anyone" because I know they trust me and so I must deserve it. I especially adore the friends that don't expect anything from you but will give you everything. And most of all I loooove my friends who love my children. Those are the friends that understand that to love you is to love whatever is part of you. that inspired me to write this post today. Today is a happy day in her life, which in turn makes it a happy day in mine. Today her daughter R.R. became engaged to a wonderful boy. (I don't know him but he must be wonderful to deserve my friend's wonderful daughter). She is the kind of friend who cries and laughs with me at the same time. She is the kind of friend I am fortunate to have at this stage of my life. When her daughter P.R.K. got married I was so so excited. I scrapped a picture of some of us close friends. We were all joyful for her. That is what my friends are like now. It may not be the 'best' layout I ever did, but it is one of the dearest to my heart. This is really an simple layout to follow. I bet you can even make a nicer one than I did. Practice writing on wavy lines on a solid paper first. When you feel ready go for it. Use a pencil first just in case you make a mistake and when you are ready go over it with a sharpee. Here is another layout I made of another very close friend. It's not about the picture at all. It's about writing down your appreciation for those who matters in your life. This is also such an easy layout to do. I once again used a sharpie to accent my layout. The middle words are from love,elsie. I don't think they sell it anymore but you can copy the idea. I love doodling on the edges of my layouts to make a frame. I also enjoy using a white backround paper. Always works. I bet you're thinking, what does this one have to do with friendship? Well this little girl who is is now a big girl, (it's 7 years later) is also someone I consider a close friend. She laughs at my jokes. We confide in each other. I trust her and she trusts me. Here we are the four of us. Her daughter. (the one from the post above). Our daughters are Friends Forever. With friendships that better me as a person every day of my life. I have so many people in this category but I will save them for later. You will get to meet them all. And while you do go scrap a layout of your close friend. You will feel so good about it. Happiness lies in the joy of achievement and the thrill of creative effort..
Today I was thinking about creativity and what it really means. Is it creating something out of nothing? nope. Only Hashem can do that. I think I like what Steve Jobs said. Creativity is just connecting things. When you ask creative people how they did something, they feel a little guilty because they really didn't do it, they just saw something. It seemed obvious to them after a while. That's because they were able to connect experiences they've had and synthesize new things. Which brings me to my knitting. I am starting a project that I am so excited about. In the book Nursery Knits there is an adorable sweater knitted from blocks of ABC. I decided to do it in Alef Bais. So I downloaded the charts from here and went to work. I love the yarn so much. Wish I could order all of them. I bet you think this looks hard. Well it is! Which got me to thinking more about what makes a creative person tick. It's a need that is always there. One day when I have my very own creativity room I will lock myself in there forever. With a coffee machine, toasted almonds, corn muffins and a Siddur. Ahhhhh! Paradise. No excuses. Do something pretty today. Or even plan to do something pretty. Planning is also good. I think this article is on the money. It certainly explains the creativity bug. Meanwhile.... I knit another sweater for Yaffa. and I figured while I'm at it I will use up the yarn left over from this project and make a 'girl' sweater. I'm totally in love with felt flowers. You will be finding them on more of my projects in the future. You should really try it. It's addicting. Also in my mind when I get the yarn I will start to work on this. 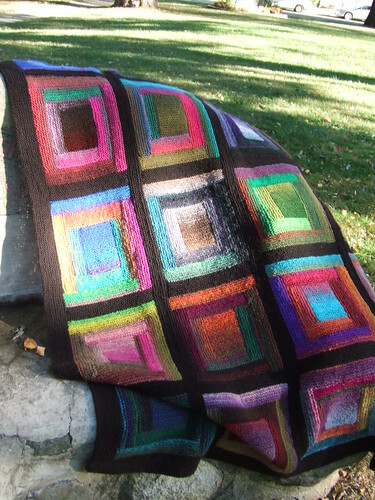 You need quite alot of yarn for this blanket, or any other blanket for that matter. Read her blog and you will see what I am talking about. But anyone who knows what it means to lust for yarn will understand how I feel. Like this nice lady here. She knows what I'm talkin' about! At the end of the day I planned more than I did today. Planning is like day dreams. They are full of light and hope. The let you dream with your eyes open. And if you are quick enough maybe you can actually turn that daydream into reality. After all, you don't even have to wake up. You already are! Why is it when someone says "Oh, I'm going to ----- for a wedding. "Or "I will be ---- for a few days attending a conference"
Or "I'm flying overseas for a cousins bar-mitzva", it seems all so glamourous. From time to time we need a break from the mundane everyday schedule. A change. Just the anticipation of 'going somewhere' seems so exciting. You plan your outfit for travel. You think about what looks best on you so if someone you haven't seen in a long while sees you they might think "Wow, she looks so good. Hasn't aged a minute since I saw her last". Living in Miami, traveling also gives me a chance to wear winter clothes. Even if it's not cold yet, at the very least I can wear my summer clothes comfortably. Anywhere I go is bound to be cooler than here. And I must admit, traveling does not disappoint. You go to parties and see friends you otherwise would not see. You have conversations that once again connect you with cousins you haven't spoken to in a while. You eat ice cream that is sold in this special location miles away from home. And I must say seeing fall in New York is worth every hour of flying. The colors are stamped in my brain like no other images I see. Maybe because I am a 'Fall' (according to Debby! )personality and all. I feel an indescribable joy and peace combined when I am surrounded by leaves of rich intense colors ranging from gold to red. That is the number one thing about New York that I miss living here in Miami Beach. Everyones inner self connects to one of the four seasons more specifically. Mine is Fall. (Yesterday in New York. My grandaughter in the park). You couldn't dream up these colors yourself. It almost makes me want to stay in New York a little longer. But at the end of the day, when night falls, I want to be home. In my own house. Where familiar colors and smells surround me. Where the noise from the streets lull me to sleep. Where the sound of the birds wake me every morning. Where the quiet of the day gives me time to think and formulate ideas. I've taken pictures of my house so that one day in the far far future my children will show their children and grandchildren where my happy place was. I feel safe. Calm. Comfortable. Take some pictures of your house. Write about how you feel. You can keep the journal hidden behind the pictures. And the next generations who want to know you. When you have several pictures you try to accentuate each one either by size or by placing a mat of color behind one or two of them. Using a white backround always works when you have lots of colors competing with each other. This is a project for anyone to do. Hopefully you can fill your pages with good memories. It doesn't have to be fancy. It has to be real. Now that I have grandchildren it's hard to convince myself that I am YOUNG. But then again who's to say what age means? I choose to think otherwise. Age is Wisdom. Experience. Self confidence. Growth. Accomplishment. Maturity. Skill. Knowledge. Intuition. Fulfillment. There is no room for OLD. For your children. For your grandchildren. And for yourself. Happiness has no age limit. Laughter has no age limit. Imagination has no age limit. Have a great attitude and you will never grow old. Here is a layout at the beginning of my BUBBYHOOD. So very easy to do. 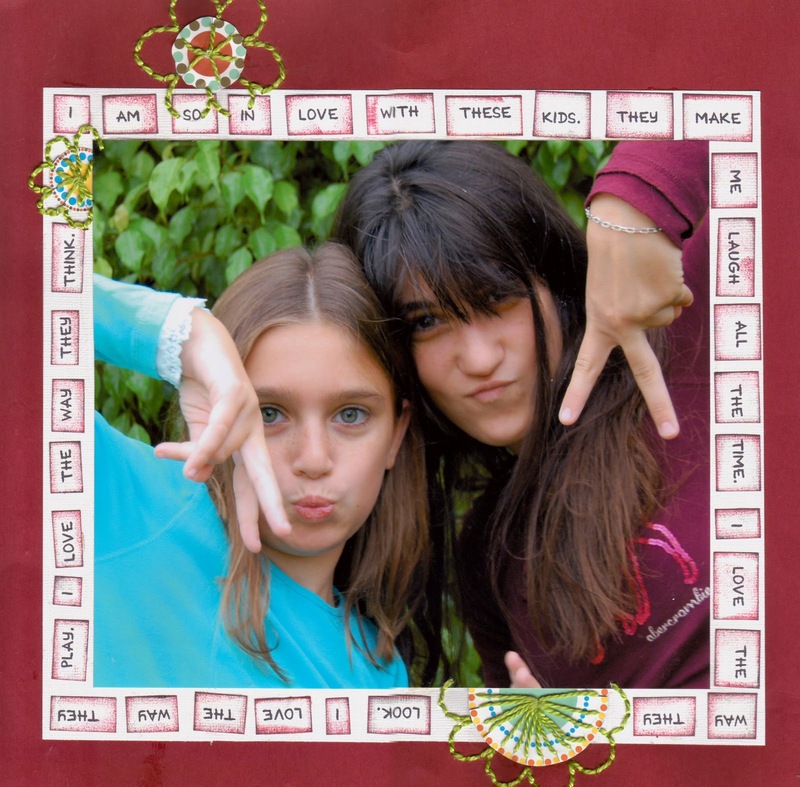 Use my two favorite scrapbooking items. White textured cardstock. And Sharpies. Use your ageless imagination and come up with something. You will possibly surprise yourself. I know I do all the time! You can cut out more flowers and use 3d sticky dots to give your layout some pop. This layout was done 4 years ago. WOW! Don't you want to be able to say that? I know you want to start scrapbooking already right? Here's a good one to start with. You don't have to make it exactly like this one but you can follow the pattern. Most of us have taken pictures in the photo booth in a giddy moment. It captures fun and playfulness at it's best. On this layout I use a lable maker for journaling. Not an expensive item and so useful for scrapbooking. If you don't have a circle cutter use a round bowl and cut around the outline. I love adding a little hand sewing. I think it adds cosiness to any layout. Here are more layouts with hand sewing. It takes time but it is so worth it. Use your skills to make your layouts your own. You see how I did the journaling here? Print the words off your computor. Or you can write them as well. Cut them into little word blocks. Ink the edges for a pop effect. I used red ink and black ink. If you don't know how to sew add a pretty flower instead. Or a circle. Anythink that does the job. My youngest brother has the most beautiful/adorable/smart/well adjusted.... (you get the picture) boys.Every summer my SIL sends me pictures of them enjoying their summer break. The years pass as I watch them grow through the camera lens. When the children were little they visited with us and my Rochelle took this picture. So here they are in 2011. I will be posting these delish boys wearing the vests I made them. So I'm driving down the street and when I drive I'm always looking out of the corner of my eye. Just in case there's soemthing interesting to see. Well this time I did a double take. I see a picture of Marilyn Monroe. Its not HER that I am interested in. It was the texture that I noticed (out of the corner of my eye). So I make a u-turn. jump out of the car and see that this picture was made with spools of thread hung on chains. If I had a sewing/knitting/art shop I would definitely buy this piece of art. Looks strange from close but the further from it you get the more beautiful it looks. Kind of a little like LIFE. When you stand to close to something sometimes you can't see the real beauty of it. Faygie's advice: take a step back and see how all the little details of life add up to one magnificent picutre. If you start something finish it! There's nothing more satisfying than finishing a project.Whenever you start something the 'yetzer harah' manages to get in there and poke at you. 'why finish this project, you have other fun things to do'. But I'm older and smarter and more experienced at the fight. If you keep the thought of how satisfied you will feel when you finish you will not stop. So here are both sweaters all done. You'll get to see how they look in them in a later post. Omg, I just had an idea. What about matching headbands? Ok. GTG. I have a project to do! What about you? Do you have an unfinished project? that you finished what you started. After all, how will you teach your children something you don't do your self?